From the great state of Texas, where so many bands of a space and psych nature reside, comes Ohm, purveyors of tripped-out avant space progressive rock. If that sounds like a mouthful it's because Ohm's influences are many, the various members being interested in all kinds of progressive and spacerock. And with two percussionists, two horn players, and no guitar, Ohm successfully sets themselves apart from the rest while still playing inventive instrumental music that is sure to please the adventurous spacer. 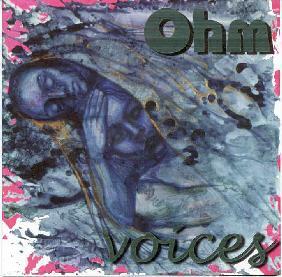 On "Voices", the band is a quartet consisting of Nathan Brown on drums and bass, Chris Forrest on clarinet and bass clarinet, S. Forrest Ward on percussion and baritone sax (now departed from Ohm), and Doug Ferguson on keyboards, electronics, and mellotron. Ferguson seems to have his hand in a number of projects having played on some Vas Deferens Organization releases, Tone Float, his own Frankie Teardrop recordings, and the upcoming Yeti release in early 2000. The 15 minute "In A Desert-Alambic / Clash Of The Titans" opens the set with a quiet and very slow building intro. It's an eerie organ and clarinet duet that made me think of horror movie chamber music. The bass clarinet soon joins the fray giving the music a Univers Zero feel, but the combination of the second, more wandering and dissonant clarinet, keeps everything very freaky and difficult to describe. When the full band kicks in the music becomes an intense, hard driving tour de force employing vintage synth equipment. Honestly, fans of early 70's Krautrock, progressive, and electronic music will drool over the keyboard sounds on this disc... and I mean the sounds, and not some retro style of the music itself. The mellotron gives the music a gorgeous majestic feel but not in the grand progressive rock manner. This is more like symphonic Faust, if you can wrap your arms and ears around that analogy. We hear the mellotron used in a similar manner on "Are You Ready?" and the closing track, "Ghostly Voices". Another aptly titled track, it is indeed ghostly. An atmospheric piece with the mellotron setting the ghostly background and slow blowing clarinet notes playing throughout. "Tension, No Release" is another track with a suitable title. The tension is between the musicians who seem to be dueling with one another, each occupying his own little corner of the song. It never becomes a full band number and I didn't take to it until infusing my brain with it via headphones. "Drones" has a heavier eerie intensity. Like Univers Zero meets The Residents in Krautrock-land. It's the keyboard sounds added to the horns and percussion that really gives this its own unique character. The music is chaotic but coherent and the drumming has a jazzy feel. "Voices Du Le Blon" is a bit more on the abstract side and there's a sample of what sounds like a traditional Cajun song in the background. The track soon becomes dominated by the electronics, utilizing classic sounds recalling Neu! and Tangerine Dream, but kept distinctly Ohm by the horns which blast away intermittently in the background. "Salt n' Pepper Cake / Fortress Of Ultimate Darkness" is one of my favorites. And whooooah!! I had to turn down the headphone volume on this one. Sonic aural assault! Electronic mayhem and the horns are screaming, playing a guitar freakout role. A whole new take on acid rock. But that's only the intro to this 18 minute track. The piece begins in a new direction developing into something of an electronic symphony exploring a variety of moods and themes. Repeating and pulsating synth lines give a mechanical edge to the more emotional orchestral segments making for an interesting contrast. And there's some good classic oooh-weee-oooh synths to add a bit of tension to the mix. Along with the mellotron, Ferguson, on this track, pulls out all the electronic stops to bowl the listener over with his collection of toys. In summary, "Voices" coherently combines influences that would appeal to both fans of Krautrock's wilder moments and avant progressive rock. Recommended. I spoke with Doug, Nathan, and Chris one evening about the band and related activities. AI: If I've got it right, "Voices" is your second release? Doug: Yeah, the first one is an LP only and that was done about two years ago. The only other thing we have out right now is we have a track on an Italian compilation. One of the guys from Rockarilla magazine does a compilation every year and he asked us to be on this one. AI: Is that a variety of music? Doug: It's all psychedelic stuff. I know Acid Mothers Temple is on it, and Tombstone Valentine... just a bunch of stuff from all over the world. AI: Was your first album the same lineup as on "Voices" or was it different? Doug: It was the same lineup. We also had a girl that played cello and flute on it too. But by that time she really wasn't a member of the band. She had moved to Austin. But she came up just to play on the album. AI: Has that affected you going down to single percussion or are you pretty flexible and don't see it as any hindrance? Nathan: It's actually freed us up a little bit more. Doug: I think so too. AI: In what way? Doug: Y'know, if you take some out then we can all stretch out more without having to crowd each other. AI: Between what I hear on the CD and what I've read on the web page you've got a lot of disparate interests. You got space, and psych, and all the progressive and avant-progressive... is this your thing Doug or does everybody bring all these interests to the mix? Nathan: I think we all equally bring in the same amount. I don't really think it's anybody's vehicle necessarily. We just all do what we really want to play and so far it seems to work whenever we're improving at a gig or something. Doug: All of us listen to progressive rock and stuff. But we all like different kinds of progressive rock and we also all listen to different kinds of music that the others don't listen to. AI: Is part of the intention behind Ohm - if there is one - to deliberately synthesize a lot of different styles or does it all just happen naturally given that you're all into different music? Nathan: It just happens naturally. In fact, we just go through these swells where we get into something that just comes out of nowhere. Like a couple months ago we were a hip-hop band. And we had three rappers. And I was just playing electronic... like an octopad. And Chris was playing basslines on his Bass Clarinet. And we lasted in that for some reason and then we just popped right out of it about a month or two ago. And we'd have different phases like that sometimes. AI: You performed as Ohm when you were doing that? Doug: Yeah, we played two shows that way. We were practicing pretty regularly with them. We only ended up playing two shows and then they just kind of disappeared. AI: I guess you're going to get a variety of responses if you shift directions. Nathan: Well the first gig we played... like I said we had three rappers... and the first gig we played two of them did rapping and one guy sat out and he was coordinator or something in a weird way. But those two guys were kind of aggressive and real exciting. But the second gig we played those two guys kind of fell off, and the third guy steps in and he has a more laid back style. It was a good gig we played but it paled a little bit. AI: But still a worthwhile diversion for you as a band just to go in different directions for a while? Doug: Yeah, I'd like to do it again if we can get ahold of them. AI: One of you mentioned improvising, are the tracks on "Voices" primarily improvised? How do you create music? Doug: Well in the studio it's a different thing. We'll start off like we would with a show, and play for an hour. And then from there we'll take the best material and overdub on top of it. And really Nathan doesn't play much of a part of that. He's actually been gone for the overdub sessions on both albums. On "Voices" pretty much me and Chris did most of the overdubbing. So it starts off as improv, and then it's shaped into something else with overdubbing and that sort of thing. And mixing too. AI: Do you perform these tracks live or do you just improvise live? Doug: Pretty much just improv. Nathan: Sometimes we may catch that vibe and do something that's similar. Maybe not on purpose. Maybe Doug liked a certain synth pattern that he was playing and we end up doing something similar, but generally no. AI: Do you have your own home studio where you can just get together and record? Doug: I kind of have a home studio set up, but we really haven't had time to use it much. AI: On "Voices" the combination of the clarinet and all the vintage synths is what for me gives the album such an exciting sound. You've got an interesting lineup of instrumentation. Is that common for you to have worked with horns? You've got a little sax in there as well? Nathan: Sam - who's not playing with us anymore - he primarily played sax since we've been together... I guess Fall of '95. But he quit doing that and Chris joined in '96 and he's always played horns. I've always switched on and off between playing bass and drums. Sometimes we've gone through periods of time where Doug will just use a drum machine or something, and I'll play bass. Doug: The only person that really has ever stayed a constant as far as what they were playing is Chris. But we all kind of switch off at different times and play different stuff. I don't even know how many times I've actually gone to an Ohm gig with the same keyboard. Cause I try to bring different stuff out each time. AI: Your a keyboard and synth collector aren't you? Doug: Yeah, I've been collecting for probably 12 years or so. AI: You said you don't typically bring the same equipment from one gig to the next. So I would imagine from one gig to the next you guys would sound very different even if you're playing the same kind of music. Doug: Right. Sometimes... like Nathan was saying he won't even bring his drums. And Nathan plays keyboards too on occasion. And bass. And when Sam was with us there was no telling what he would bring cause he makes his own instruments. AI: He makes his own instruments. Doug: Yeah. He makes drums, and just oddball instruments out of metal, wood, and things. AI: As far as what everybody is going to bring to a gig, is there any plan or do you like to leave it to whim. Nathan: Well I know that a lot of times I kind of leave it to whim. A lot of times when we're getting together on a regular basis... a lot of times I've been playing drums, and then we'll have a gig, and last minute I'll just not feel like bringing my drum kit out. So I'll bring bass or something like that. It always ends up working out. Doug: It's pretty much unplanned. Usually the night before I'll think about what I'd like to bring out for the show. But nothing's set in stone. AI: There's a part on the "Salt n' Pepper Cake" track that sounds like searing acid guitar... is that clarinet? Doug: Yes it is. He gets some crazy sounds. AI: He's not here to answer but I was wondering if you could tell me what kind of effects he runs his clarinet through. Doug: He's got two Boomerangs which is like a looped delay... slash sampler pedal so he can play and then loop it. And it'll continue and then he can play on top of that. And then he's also got a DigiTech... an effects processor. That's probably how he got that guitar sound. When he started he'd never been in a band before. He'd just played with the UTA Orchestra. Nathan: University of Texas at Arlington. He's about to graduate from there. Not with a music degree but he's always played with the school orchestra. AI: Doug, you want to tell us about your keyboard collection? Doug: I guess my prize keyboard is my Mark 2 Mellotron. I don't know if you're familiar with the different mellotrons, but this is the big dual manual... the one that was used on the early Crimson albums. It's something I was really really lucky to find. It took me ten years to find one. So that's probably my top keyboard, but it's not restored yet. I've got a 400 Mellotron too, the smaller one. My best synth is probably my EML-101, which is kind of an American clone of an ARP 2600. And I've also got a Korg PS-3100, which I like a lot. It's got a really unique filter that I've never seen before on another synth. It's got a lot of the sounds you hear like on the Blade Runner soundtrack. AI: What's a "combo organ"? I saw that mentioned on your web page. Doug: A Combo Organ is basically... in the 60's organ companies started manufacturing these small, supposedly lightweight... most of them weren't, organs to compete with Hammond B-3's. Because Hammond B-3's were like 450 pounds. So they just made these little tiny ones. And they just called them Combo Organs because they were so compact. A lot of times they're pretty heavy. But a lot of the organ sounds you hear Pink Floyd use, millions of bands have used them. A lot of the New Wave bands like Blondie. It's got that real grainy, piercing sound to it. AI: As far as different projects I know, for Doug anyway, that Ohm is just one of a number of things. You're on Vas Deferens Organization albums, you've got the Yeti project now, Tone Float, Frankie Teardrop... does any of this stand out for you or do you like to just keep moving through all sorts of different projects? Doug: I just like to keep busy. If I'm not working on something then I feel like I'm being lazy. I guess you can call it an addiction or something. Yeti has definitely taken control a lot. I'm really in deep with that. We practice three nights a week, and it's a much more involved thing than I've ever been in before. AI: Are any of the Ohm members involved in that or is it a whole separate thing? Doug: It's totally separate. In fact, it was kind of already a band and I joined. Nathan: It's real good sounding stuff. AI: Is it far off stylistically from Ohm or the other things you've done? Doug: To me it sounds like it's got elements of punk mixed with symphonic prog. It's definitely got a French vibe to it. We all really like Magma, and Univers Zero and stuff. Hey... Chris is here. AI: Well now that Chris is here we had been talking about clarinet so if you don't mind I'm going to backtrack a little and get his comments. The guys were mentioning that Ohm is one of the first bands of this kind you've worked with. You've played primarily with your college orchestra. Chris: Actually I've been doing the UTA symphony orchestra for maybe about three to four years now. I've also done a couple of other things. There's actually what they call wind bands, which is just woodwinds and also brass players. I've been doing that off and on since probably the fifth or sixth grade. There was one thing I did do that was very similar to Ohm. There was a new music ensemble held by a conductor by the name of Dr. Chase. But there we did more of the contemporary literature. Also more improvisation and more atonal type music. AI: So with that background how did you happen to start running your clarinet through efx to get all the fun sounds on this album? Chris: Well, I guess how I really started was that I still remember vividly Nathan asking me to come out and play with Doug and a couple of other people. And of course one of the first things that came up was miking. And we messed around with a couple of things and they also had a couple of just basic effects pedals... like I believe they had a delay pedal and a couple of other things that someone else was using. And I played around with it a bit and I thought it was really kind of nice to expand the sound of the clarinet. Also, I guess for me having a very dry sound... it's good to have a clean dry sound, but in other cases I really felt like I was the sore thumb of the group sometimes, where the instrument itself - with everything else that was going on - it didn't have the right type of mood. Here everyone was doing something brutal and crass sounding, and then here you get this clarinet sound coming through and it sometimes didn't work out. So I guess maybe a month after staying with Ohm I went ahead and picked up a couple of efx units and started experimenting with them and seeing exactly what type of tones I was able to generate out of it. AI: So all of this was a result of your involvement with Ohm? Chris: Well, some of it, yes. There are a couple of things you can do on a clarinet that are non-standard. One thing is called multi-phonics where you get a clarinet to have two tones coming out at the same time. I had about maybe two or three months before getting in touch with Ohm, I had played this one piece of new music on the required multi-phonics. I guess some of the ramblings, the wild shifts in... sometimes I just try to play as many notes as possible on the clarinet, and some of those things I'd actually toyed around with before. But with Ohm being 60-70% electronic I felt like trying to incorporate a technical aspect or electronic aspect to the sound that would make it gel together more. AI: I'll mention again now that you're here that one of the standouts on the album for me is the part on "Salt n' Pepper Cake" where if I didn't know what it was I'd think there was an acid guitar segment which is actually your clarinet. Chris: That's one thing I enjoy sometimes. Actually being able to tell people, yeah, never thought you'd be able to hear a clarinet sounding that bad. Y'know, like you said sounding like an acid rock guitar. It's a lot of fun. It's times like that where I can use the clarinet more in the aspect of taping a tone generator, and being able to shape our thoughts and so forth into actual sound. AI: When you go back to the orchestra after doing all this do you feel limited or refreshed? Chris: Refreshed. I really have a split personality. I really enjoy a good orchestra piece be it Rachmaninoff, be it Shastakovich... for me having that one aspect of having a controlled, well defined system where you have certain notes being played at certain points, that's one thing I enjoy. But also I enjoy the other side as well where you go through and you have a limited knowledge of what you're going to be doing. I guess for me it's really just refreshing. AI: I guess it's been going on for some years but tell me about the Melodica Festival held in Texas. Doug: The whole Denton indie scene. AI: It's kind of hard not to notice you've got a lot of bands in Denton. Is there really a scene where all these bands are into all this music? Doug: It's kind of weird. There's tons of bands and most of them don't really sound like each other, but everybody knows each other. It is kind of a community in a way. Also the University of North Texas is there. It's actually branched its way down to Austin now too. AI: Any other Ohm or other news you'd care to share? Doug: You gotta tell him about Chord Pop Nathan. Nathan: I'm working on this thing I'm going to call Chord Pop. It's a lot of progressive influences funneled down into late 70's/early 80's pop styles. I guess the way pop sounded, like Duke-album Genesis, or late 70's Todd Rundgren, Steely Dan, Joe Jackson. Just piano or keyboard rock kind of stuff except it has the chords or structure of progressive stuff that wasn't as poppy like Henry Cow. It has those kind of chords. AI: Any projected release date for Yeti? Doug: I want to say March, but I don't know. We want to do a short tour up North over Spring Break with Falcon Project, Wanz Dover's band. So I think Yeti's going to do a short four day tour up to Cleveland and Detroit, Chicago. You can visit Ohm at their web site.